Introduce numbers with flashcards which contain labels and check the vocabulary with picture flashcards. Vocabulary: one, two, three, four, five, six, seven, eight, nine, ten. 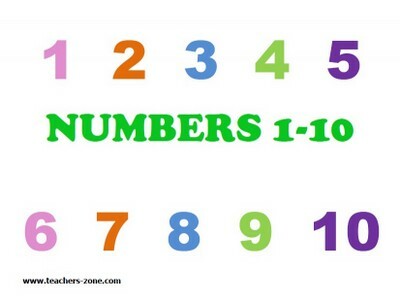 Click the image to download numbers 1-10 flashcards with labels. Click here to download flashcards for numbers 1-10 without labels. Vocabulary: eleven, twelve, thirteen, fourteen, fifteen, sixteen, seventeen, eighteen, nineteen, twenty. Click the image to download numbers 11-20 flashcards with labels. 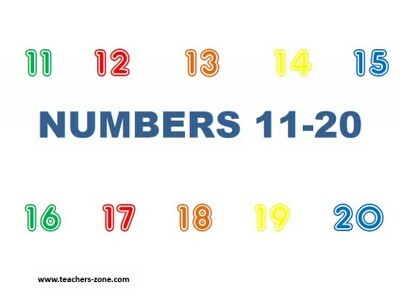 Click here to download flashcards for numbers 11-20 without labels. Vocabulary: twenty (twenty-one, twenty-two, twenty-three...), thirty (thirt-one, thirty-two, thirty-three...), forty, fifty, sixty, seventy, eighty, ninety, a hundred. 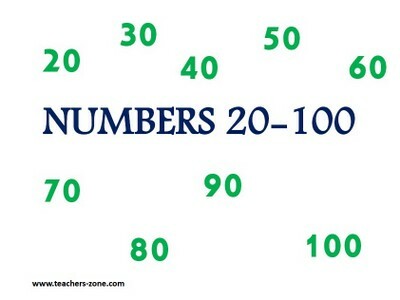 Click the image to download flashcards for numbers 20-100.